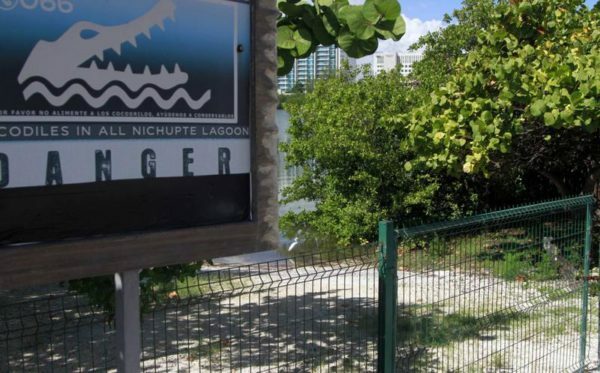 CANCUN — A tourist, apparently in an inebriated state, was attacked by a crocodile when he allegedly went down to urinate on the shore of Nichupte Lagoon. The subject struggled until escaping from the crocodile, however, he lost part of an arm. The events occurred around 6:00 am one day last week when a tourist walking along Kukulcan Boulevard came down to the shores of Nichupté Lake to urinate, when suddenly he was surprised by a crocodile attack. Warning signs advise of crocodiles in Nichupte Lagoon in Cancun. The animal tried again and again to pull him into the lagoon, but the man struggled to save his life, until he was released by the crocodile, who returned to the water with part of an arm that was ripped from this person. At the scene of the incident, paramedics from the Red Cross arrived in an ambulance and after giving first aid, they transferred the wounded man to a hospital in the center of Cancún. Medical reports indicate that the state of the injured man, apparently an American from California, whose name has not been formally released by authorities, is delicate, after surgery in the hospital.